The other benefit of this approach is that by using python, it is simple to incorporate all the power and convenience of pandas (and other python tools) for manipulating the data. Another nice benefit of this approach is that the user can access all the plotting capabilities already available through plotly’s existing framework. Finally, I am very happy to see this open source model adopted by companies. For those individuals that just want to use the open source tools, they are hosted on github like so many other packages. However, if someone wants/needs formal support there is a dedicated company behind the package that provides additional value added support such as training and large scale deployments. In the future, I would recommend double checking the installation guide to make sure that the correct versions are being used. By opening up a browser and pointing to the url, I could see a nice interactive bar chart as shown in the docs. This confirmed that all was installed and working as expected. The next step was building my own version. 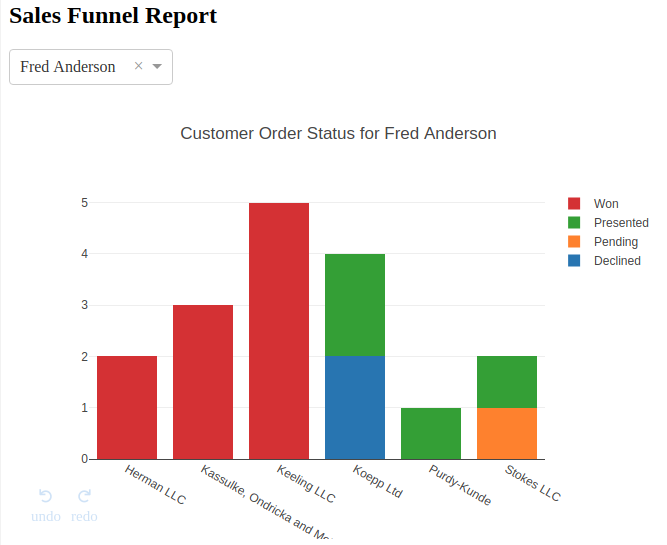 In order to build a little more complex example, I decided to use the data from the Creating PDF Reports article to build an interactive bar chart that shows order status by customer. If you are following along closely, you may notice that I am importing the plotly.graph_objs in this example whereas the documentation uses dcc.graph to build the plot. As I was going through this article, I felt that it was easier to use the plotly graph object since there were a lot more examples of using it than there were the plain dcc.graph for the simple cases. It’s a matter of preference but it seemed a little more straightforward to me during the creation of these examples to use the plotly graph objects. Now that the data is simply tabulated by customer and status, we can build out the bars that show the various customer status counts. The convention for plotly is that each item being plotted is usually called a trace . In this example, we want to plot Declined, Pending, Presented and Won as stacked bar charts so we need a trace for each one. Because we pivoted the data, the customer name is in the index and the individual values can be accessed through the hierarchical index on the column. Finally, the name will be used on the legend to describe the trace. Now that we have set everything up, we can build the actual dash app. The basic structure of this code is to build the app, layout the HTML components and create the figure dictionary which contains the instructions to build the graph as well as provide other layout options. The most challenging aspect of this is the nesting of the HTML components. I like the fact that it was easy to get started without having to create the standard HTML/CSS/JS boilerplate needed for a modern web app. However, I do recommend using a good editor so it is easy to manage the code style and match the brackets and parentheses. After laying out the HTML components, the next step is to define the figure using a dictionary that contains the figure as well as the data and layout options. In this case, the layout was needed to define that the bars were stacked and provide an overall title. Here is a quick animation that shows all the interactive options you get for free by using this framework. It is pretty amazing when you think about how much interactivity you can get with a fairly simple application that weighs in around 33 lines of code. For future reference, the code is available on github. The other really useful side effect of this approach is that all the hard work around making this responsive and scalable on different browsers is already taken care of for you. No additional CSS/JS work required. Pure python all the way! The above example goes a little bit further than the first demo in the documentation. The real power of Dash though is its ability to do more complex interactions. Dash provides several interactive components out of the box including Dropdowns, Multi-Select Dropdowns, Radio Buttons, Checkboxes, Sliders, and Text Input. All of them can be easily constructed and tied into your plots to drive various interactive options. For the more complex demo, we can modify the app to allow the user to select one of the managers via a dropdown and view the single manager’s results only. Now that the data is read in, we need to get a list of all the managers in order to populate the dropdown which can be done using pandas unique function. The next block of code will create the app and add the layout which will include a dcc.Dropdown to define the manager dropdown field. There a couple of items to note in this section. The dropdown needs to have an id defined that can be referenced later to drive our interactivity. You may also notice that the dcc.Graph code only contains an id and not the rest of the content we saw earlier. Since this is an interactive plot the dcc.Graph acts as a placeholder that we will define in a moment. The final aspect of this section is that there is a style attribute which is a convenient way to make sure the component (in this case the dropdown) is only 25% of the screen and does not span the entire browser. Now that the layout is completed, we can build up the interactive components by adding a callback decorator to a function that manipulates the data and returns a dictionary. This resulting dictionary looks like the figure dictionary defined in the simpler example above so the basic concept continues to build upon itself. This looks a little complex but all it is doing is providing a wrapper around the update_graph function that defines an output and an input. In this case the output is the funnel-graph and the input Manager. In other words this decorator knows how to link the drop down definition to the function and take the output and place it in the dcc.Graph . This little bit of decorator magic is where the real power of Dash can be seen. It may seem a little complex at first but the basic concept is straightforward and once you understand it, you can really build some complex interactive visualizations. The rest of the code manipulates the data based on the Manager drop down selection and displays the results. This portion of the function filters the data based on the dropdown to include only a subset of the managers - or include all managers is the default is selected. After filtering the dataframe, the code pivots the data to construct the tabular results similar to the earlier example. The final step is to return a dictionary with the figure and layout defined. The decorator we defined earlier will make sure that the updated chart gets included in the output display. Here is the link to the github code.